One of chrome’s best easter egg is the offline side scroller dino game. In this tutorial, I will be teaching you how to recreate a simplified version of it in SVG. For this project, we will be using handlebars library to draw updates to the screen as it scrolls along. For a start, we will setup the code to render the SVG. We will only display the ground and the dino for now. Every game will have a update loop to make the necessary movements and redraw the display. Our update loop will contain the code to render the game’s SVG figure. This update loop is usually accompanied with a fps variable, indicating how long apart each update function call is. The handlebars template for generating the game contains only the background, floor and the dino, as of now. Implementation To receive the clicks, we will have an overlay that will spread across the screen. The jump function is really simple, there will be 3 main variables for this function, dino_y, dino_dy, and env_g. The first variable, dino_y stores the current y coordinates of the player. dino_dy represents the vertical speed, positive for moving upwards, negative for moving downwards. env_g is gravity. Using these 3 variables, and some simple physics, we can make the dino jump. Here, we will be making good use of the fps variable. Each variable change will be in terms of 1 seconds, so the fps will be used to add increments of the change during each update. For each update loop, an increment of x/fps is added. After 1 second, the full value x will be eventually added. In the game, there are all these different different obstacles that will be created on the fly. This part will show you a method of generating the obstacles. There will be 3 classes of obstacles, small, medium and large, correponding to the different obstaclesin the original game, spike, small and large cactus. For each set of obstacles (cactus or spikes), we will have a random distance between them (between 500px to 1200px). Then depending on the type of obstacles, there will be different number of it in each set. There will always be 3 spkies, 2 to 3 small cactus, and 1 to 2 large cactus in our game. Of course, we will have to animate the obstacles too. For that we will have the env_dx variable to set the speed of the obstacles, which will be used in the update loop to move the obstacles along. In the update loop, the createObjs function is called to replenish the obstacles after the past spikes and cacti have long moved off the screen, thus creating an “infinite level”. For the original dino game, the score is depedent on how long you survive in the game. We will thus have another timeout just to increment the score, 10 points per second of surviving. 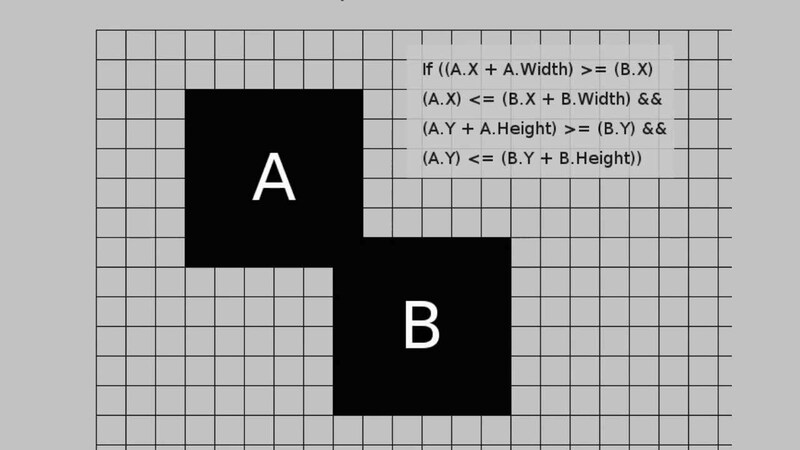 Since all the objects in the game are rectangles, we can use the simple boundary box collision test. The brief idea is that the x-axis segments of the 2 bounding boxes cannot collide, same goes to the corresponding y-axis segments. The collide function takes in the information of an obstacle, gets its extreme boundaries and compares it with the player’s extreme boundaries. If there is a collision, the function will return true. Time for some refactoring. To create a game that can be started and restarted over and over again, we will wrap all the initialization and the start of the update loop into a reset function. Along with it, we should have a function to end the update loop, this will be aptly named lost. The will contain all the code for removing the timeouts and resetting the score. As for the code, I will leave it out as an implementation exercise. Have fun!